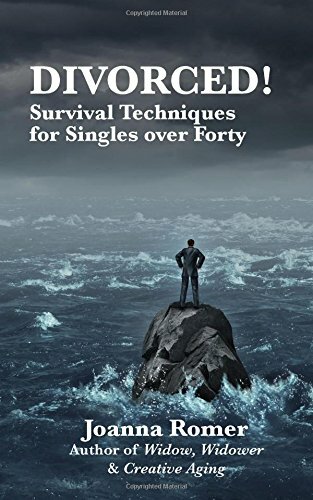 On the cover, “Divorced!” by Joanna Romer states that it has survival techniques for “Singles over Forty.” As someone who was divorced at 35, I think that this would have been a great resource for me to have even at that age. Each chapter is written by a man or a woman that has survived divorce. Their stories reflect the topic being covered, which can range from the actual divorce, recovery, reclaiming yourself, to starting over and your new life. There are a lot of incredibly valuable stories shared in the 130 pages of text contained in this book. I found each story to be valuable, if not for me, for a friend who is going through divorce as I write. There are meaningful guidelines offered to help remind the reader about what steps they can take for healing and moving on with their life. There is a definite emphasis on relying on your faith to get you through the darkness. For many readers, this will be comforting. If you are getting divorced or close to someone who is, “Divorced!” by Joanna Romer is an excellent tool to help get past the pain and move on with life. I really wish I could have read it 15 years ago when I was going through my divorce and couldn’t possibly see my life ever getting better. Fortunately, it did, however, it would have been wonderful to read about the experiences and follow the advice from others who share in this story. I definitely would have had hope for a better future. I got that future anyway, but it was a painful path to follow on my own.